The GOP gubernatorial roster continues to be the largest the party has enjoyed in the post-World War II era, although the total number of governorships a party controls does not mean much collectively: It’s not as though there is a national legislature made up of governors where the Republicans have outsized control, although obviously a party wants to hold as much power as possible. By that measure, the Democrats did see their state-level power expand slightly in 2017. They traded the governorship of a small state, West Virginia, for that of a considerably bigger one, New Jersey, and they added the Garden State and Washington state (thanks to a special election victory in a key state Senate race) to their small group of state government “trifectas,” states where one party controls the governorship and both chambers of the state legislature. The Democrats will now have eight trifectas, up from six at the start of 2017, according to Ballotpedia, while the Republicans now have a whopping 26, up from 25 at the start of 2017 (the Republicans also control another key trifecta — the presidency and both houses of Congress). The Republicans are at such a high-water mark that it will be hard for them to net seats. They are defending 26 of the 36 seats being contested this year, while the Democrats are only defending nine. Add to that challenging map the fact that half of the 26 Republican-held governorships are open seats, as well as the usual midterm trend that breaks against the White House even in non-federal races, and it becomes even harder to imagine a net Republican gain. Whichever party wins a majority of these five governorships probably will have had the better night in November, particularly because all five governors play a key role in congressional redistricting, which is coming after the 2020 census and will be overseen by the governors elected this year in these (and many other) states. (The Supreme Court may place limits on gerrymandering this year, but for the time being let’s set aside that possibility.) Illinois is home to one of the few Democratic gerrymanders in the country, while the maps in the other four states all significantly favor Republicans (even after a court decision somewhat dulled the GOP edge in Florida). Govs. Charlie Baker (R-MA) and Phil Scott (R-VT) are both considerable favorites next year, as they sport lofty approval ratings and have thus far avoided truly strong Democratic opponents. Both could potentially get swept up in a huge wave, but Democrats do not appear to be prioritizing either race. 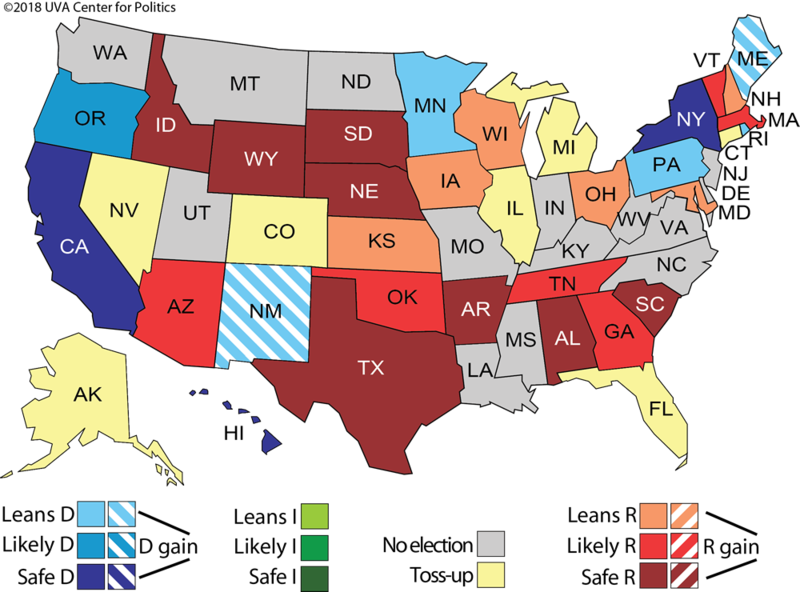 A key part of Baker and Scott’s electoral success is that they generally support abortion rights in liberal states. So does Gov. Chris Sununu (R-NH), who is potentially more vulnerable in November but still starts as a favorite. Democrats hope that their 2016 nominee, former Executive Councilor Colin Van Ostern, takes another run at Sununu. Republicans currently hold four of the six New England governorships. The Democrats’ best chance to cut into that edge comes in Maine, where Gov. Paul LePage (R) is term-limited after winning the governorship twice with a plurality. Both parties seem to see the Democrats with an edge in this seat, particularly after Sen. Susan Collins (R-ME) decided against running. State Attorney General Janet Mills (D) may be the Democratic favorite, although she has plenty of competition (her post is elected by the Maine state legislature). A wild card is state Treasurer Terry Hayes, an independent and former Democrat. A Republican path to an upset might involve her hurting the eventual Democratic nominee, but at this point a GOP win would be an upset, and we’re moving Maine from Toss-up to Leans Democratic. It is possible that Republicans could actually sweep the New England governorships this year. That is not likely, but if they can hold Maine and the other aforementioned states, they do have two credible targets in Connecticut and Rhode Island. Next door in Rhode Island, Gov. Gina Raimondo (D) has been hit from both left and right, but Republicans may not have a top-tier challenger to exploit her weak approval rating. There could be one or more prominent third-party candidates, including Trump-backing former GOP state Rep. Joe Trillo, whose presence in the race probably helps Raimondo. In both Connecticut and Rhode Island, Republicans likely would benefit from a free-spending outsider in the mold of Govs. Rick Scott (R-FL) or Bruce Rauner (R-IL) emerging, but it’s unclear if one will. In New York, Gov. Andrew Cuomo (D) appears set to seek a third term, and the GOP lacks a credible challenger to him or to other top Democratic statewide officials. Cuomo should be fine regardless but a weak statewide ticket could hurt Republicans down the ballot in several key U.S. House races: Democrats found out the dangers of effectively not challenging incumbent Republican governors in Nevada and Ohio in 2014, when they suffered wipeouts down the ballot because of poor turnout. This is also a good place to break from our otherwise geographic order of races to address California and Texas. The former is an open seat that Democrats are almost certain to hold, and it’s possible two Democrats could advance to the general election because of the state’s top-two primary rules (two Democrats could also advance to the general in the U.S. Senate race). That possibility, and California’s increasing Democratic lean, may also hurt Republicans down ballot and may have contributed to the decisions by Reps. Darrell Issa (R, CA-49) and Ed Royce (R, CA-39) to retire this week, moving Royce’s seat from Leans Republican to Toss-up and Issa’s from Toss-up to Leans Democratic in our ratings. In Ohio, Attorney General Mike DeWine (R) is the likely nominee for this open seat. His union with Secretary of State Jon Husted (R), with Husted taking the lieutenant governor slot, was the first big surprise in Ohio politics over the past couple of months. The second was last week’s decision by state Treasurer Josh Mandel (R) to drop out of the U.S. Senate race against Sen. Sherrod Brown (D). Mandel had long sought a rematch of his unsuccessful 2012 challenge to Brown, but exited the Senate race to help his wife with a health issue. In our ratings, the Ohio Senate race remains Leans Democratic as we wait and see who emerges to challenge Brown. While the GOP primary field has contracted, the Democratic one is still large. The late entry of former Attorney General Richard Cordray (D), who has been in Washington the past several years as director of the Consumer Financial Protection Bureau, seemed to give the race a new favorite. And while he probably is the likeliest nominee given his fundraising potential and likely support from Democratic heavyweights, he is far from dominating and has not really scared off his rivals. Cordray named former Rep. Betty Sutton as his running mate on Wednesday, removing one of the other candidates from the race. But former Rep. Dennis Kucinich (D), the two-time presidential candidate who was most recently a Fox News commentator, appears set to enter the race, so one former Northeast Ohio House representative, Kucinich, likely is taking the place of another, Sutton. Also, state Supreme Court Justice Bill O’Neill — one of only two Democratic statewide officeholders in Ohio, and author of some very piggish comments on his sexual history — also is staying in, and we’ve heard rumors that O’Neill, who possesses a golden last name for Ohio voters (which is why he got elected to the court in a technically nonpartisan race), may be leading at least one private poll, although O’Neill won’t have any money to spend and should be easy to attack if it comes to that. Three other candidates who have been in the race for much longer than the three previously mentioned candidates are Dayton Mayor Nan Whaley, state Sen. Joe Schiavoni, and former state Rep. Connie Pillich. Michigan, a bluer state that also has an open governorship, is already a Toss-up. While he faces credible primary opposition from Lt. Gov. Brian Calley (R) and others, state Attorney General Bill Schuette (R) is the likely GOP nominee. Former state Senate Minority Leader Gretchen Whitmer (D) is the likeliest one to emerge from a crowded Democratic field. Term-limited Gov. Rick Snyder (R) is likely more of a burden than a help for the GOP nominee at this point, and if Democrats can’t win Michigan with an unpopular Republican in the White House, they may regret the decisions by some bigger-name possibilities, like Sen. Gary Peters (D), Rep. Dan Kildee (D, MI-5), and Detroit Mayor Mike Duggan (D), to take a pass on the race. In Wisconsin, Gov. Scott Walker (R), unburdened by term limits, is seeking a third term and a fourth statewide victory (he won regular elections in 2010 and 2014 and a recall in 2012). His three elections were very similar — he won between 52%-53% in all of them, and the Democrat won between 46%-47%. With the national dynamic now different, and the White House burden now falling on the GOP side instead of the Democratic one, it’s easy to imagine an even closer race. So like Ohio, this may be a Toss-up before too long. But not yet: There is yet another giant Democratic primary field of questionable strength to sort out. The leading candidates are probably state Superintendent of Public Instruction Tony Evers, 2012 recall lieutenant governor nominee and state firefighters union head Mahlon Mitchell, and state Rep. Dana Wachs. Liberal Madison Mayor Paul Soglin (D) just entered the race earlier this week. In what is an ongoing theme, the Democratic field is also big and uncertain in Iowa, where Gov. Kim Reynolds (R) should be the GOP nominee after taking over for Terry Branstad (R), now the ambassador to China. One of the emerging trends nationally last year was Democratic overperformance in special elections across the country, with Democrats running significantly ahead of Hillary Clinton’s 2016 showing in many districts. Some of those strong showings came in a handful of races in Iowa, and that combined with a recent Des Moines Register poll showing Trump at a weak 35% approval in the Hawkeye State makes one wonder if Trump’s strong performance in Iowa is not built to last. The final competitive Midwest gubernatorial race is in Minnesota, a swing state where the Democrats are likely to have the stronger gubernatorial nominee. That said, former Gov. Tim Pawlenty (R) could still run for his old job or for the new Senate special election being held this fall. If he ran for governor, we’d move the gubernatorial race from Leans Democratic to Toss-up. If he ran for Senate, we would probably still have appointed Sen. Tina Smith (D) as a small favorite because it would be easier for Pawlenty to separate himself from a potential Trump drag in a state-level race. Republicans should be fine in defending Gov. Pete Ricketts (R-NE) and open seats in Idaho, South Dakota, and Wyoming. That observation on abortion extends to a group of southern races where Republicans are clearly favored but where Democrats could potentially spring an upset, particularly if they can find nominees who fit these conservative states. The only elected incumbent running in the South is Gov. Asa Hutchinson (R-AR), whose breezy path to reelection faces an annoyance in the form of a very hard-right primary challenger. Govs. Kay Ivey (R-AL) and Henry McMaster (R-SC) took over after the departure of their predecessors mid-term; both are favorites to win their nominations in competitive primaries. 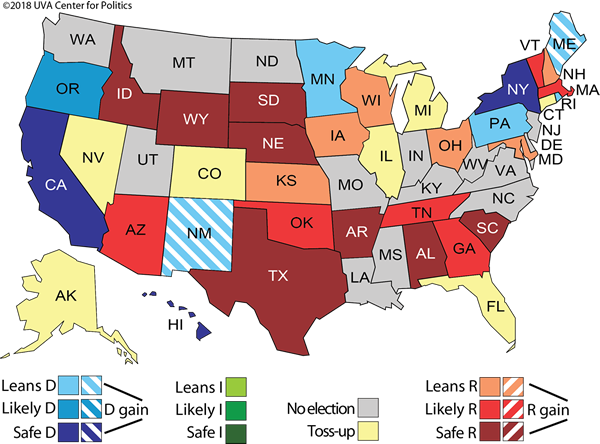 Democrats see slivers of hope in both states but we have both as Safe Republican. Open seats in Georgia and Tennessee seem more two-party competitive but Republicans start clearly favored in both. The main event in the South, and arguably the nation, is Florida, where Democrats are trying to win the governorship for the first time since 1994. In Arizona, Gov. Doug Ducey (R-AZ) should be fine, although heavy Democratic investment in the state’s U.S. Senate race and a few House races combined with potentially heavy Hispanic turnout keeps this on our radar as a deep sleeper. In Hawaii, Democrats seem like a lock to hold the governorship, but there should be a very competitive Democratic primary between Gov. David Ige and Rep. Colleen Hanabusa (D, HI-1). We conclude with probably the most confounding race of them all: Alaska, where independent Gov. Bill Walker is running for a second term. The state is facing economic problems tied to the low price of oil, and several Republicans are aiming to win back the governorship. Complicating matters is the possibility that Walker could be nominated in the Democratic primary, or there could be a three-way race featuring former Sen. Mark Begich (D), who hasn’t ruled out a bid. We would think a split vote would benefit the eventual GOP nominee, but this is a strange race that is probably the best Republican pickup opportunity in the country.